Offering FREE brake inspections is just the first way that the Quicklane surpasses other Auto Maintenance Repair shops. You won’t need to drive all over Portland looking for the best deal because we offer brake specials everyday. We understand that brake replacement can be intimidating so we compiled some frequent asked questions to help. Of all the systems on a vehicle, the brake system is the most important. The best way to know for sure if you need new brakes is to have your vehicle professionally inspected. drums and rotors. This thorough investigation ensures that Quicklane technicians always Fix It Right the First Time. What is the Lifetime Brake Pad Guarantee and what is the catch? Eligible Motorcraft brake pads purchased after July 1st 2014. Nontransferable. Requires copy of original Repair Order and completion of any other necessary brake service such as brake rotor service. Replacement Motorcraft brake pads must be installed by a Quick Lane technician to be eligible. Labor costs not included. Restrictions and exclusions apply. See Quick Lane Tire and Service Center Service Advisor for details. With the new LIFETIME GUARANTEE on Motorcraft brake pads, there’s no reason to risk driving on worn down brake pads. 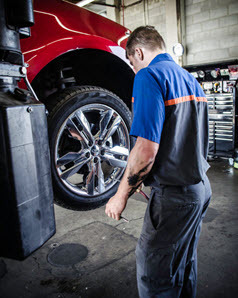 Brake with confidence when you choose the Quick Lane Tire and Service Center in Gresham. We only use brake pads that are designed and engineered specifically for your vehicle and provide optimal stopping power when you need it.